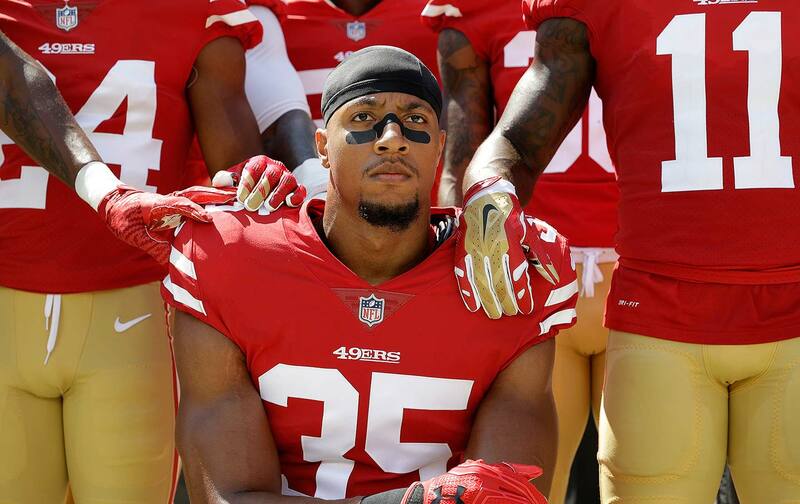 After kneeling with Colin Kaepernick, Eric Reid is finally back with an NFL team and still speaking truth to power. The most iconic sports images of our times are of Colin Kaepernick kneeling during the national anthem over the course of the 2016 season to protest police violence. Often these photos are framed to show only Kaepernick, as if he is shouldering this burden alone, but when the photographer deigns to pull back, there is one player consistently kneeling beside him. That player is free safety Eric Reid. NFL fans know Eric Reid as a top-caliber safety, a first-round draft pick who made the Pro Bowl in 2013. People following the intersection of sports and politics further learned about Reid this off-season, as he, like Kaepernick during the previous summer, found himself suspiciously unsigned and ignored—something that could only be read as a kind of punishment for Reid’s insistence on kneeling during the 2017 season and his vocal support of Kaepernick’s message. Reid then joined his “brother” Kaepernick in a collusion lawsuit against the league. Next year will be 2019. It will mark 400 years since the first slaves touched the soil of this country. That’s 400 years of systemic oppression. That’s slavery, Jim Crow, new Jim Crow, mass incarceration, you name it. The Great Depression—they come out with the New Deal, and black people didn’t have access to those government stimulus packages. The New Deal set up what is known as the modern-day middle class. We didn’t have access to those programs, the GI Bill, social security, home loans, none of that. So this has been happening since my people have gotten here. And so, I just felt the need to say something about it. Reid was also asked about the Players Coalition, a group of NFL Players led by Philadelphia Eagle Malcolm Jenkins that has access to $89 million to pursue community programs. This deal was widely seen, although Jenkins denies it, as a quid pro quo to stop protesting. Reid, who left the Players Coalition last season, called it out as “an NFL-funded subversion group.” Oh, and Eric Reid also said that even though he had signed with Carolina, he would be continuing his collusion lawsuit against the National Football League. I remember meeting Eric Reid at one of Colin Kaepernick‘s Know Your Rights camps. He was shy, soft-spoken, and fiercely intelligent. To see him open up express that intelligence on this stage is to see in one person the personification of an entire generation of athletic protest. It was stunning and a vindication of the ways that struggle can change people in fundamental and organic ways. As Reid said, “I will keep speaking for my people.” The name Eric Reid is not spoken in the same tones with which we mention Colin Kaepernick, but perhaps it should be.